Oklahoma Gov. 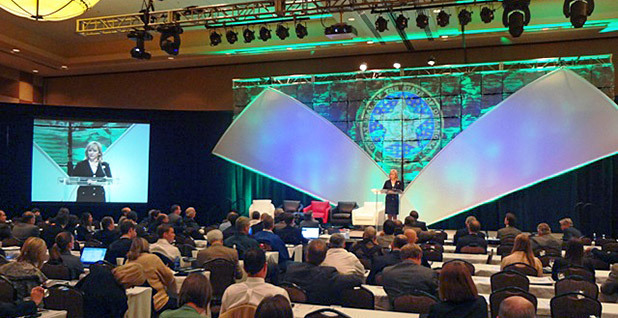 Mary Fallin speaks at an energy conference that took place four days after a damaging earthquake in the state. Photo courtesy of the state of Oklahoma. OKLAHOMA CITY -- As she knocked on the federal government's door for aid in the wake of a damaging earthquake in 2011, Oklahoma Gov. 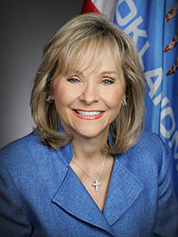 Mary Fallin (R) avoided talking about one aspect of the earthquake -- its cause. Too "awkward," said Fallin's communications director, Alex Weintz. "The problem is, some people are trying to blame hydraulic fracturing (a necessary process for extracting natural gas) for causing earthquakes," Weintz wrote in an email, vetoing mention of the earthquake at an energy conference. "So you see the awkward position that puts us in. I would rather not have to have that debate." Oil and gas has been her biggest financial backer, and it's the most prominent industry in the state. But scientists say oil and gas activities have caused hundreds of earthquakes, rattling her constituents and their homes. It's not hydraulic fracturing, or fracking, that's causing the quakes they're feeling. Instead, scientists say, it is wastewater disposal. Fracking and other production activities create millions of gallons of wastewater that get injected into deep underground wells. In certain instances, the fluid can seep into faults, lubricate them and unleash quakes. EnergyWire reviewed thousands of pages of emails and other documents provided by Fallin's office under the Oklahoma Open Records Act. They show a team in the governor's office that moved slowly to address the quakes even as the earth rumbled more and more frequently. Her top aide told staffers to "make this go away" when earthquake preparedness came up in the state Legislature after the November 2011 quake. When constituents had questions, her office used talking points borrowed from an oil company. And, with Fallin at the helm, Oklahoma has done far less than other states hit by smaller and less frequent man-made quakes. Fallin was unavailable for an interview, according to Weintz. But he said his boss' views have progressed along with scientific understanding of the quakes. "As we have gathered more data and the science has evolved, the governor has said that natural causes alone cannot explain the increasing number of earthquakes," Weintz said in a statement provided to EnergyWire last week. "As multiple studies have suggested, wastewater disposal wells are likely a contributing factor to increased seismic activity in Oklahoma." Oklahoma Gov. Mary Fallin. Photo courtesy of the state of Oklahoma. As for vetoing discussion of the quake at the energy conference held days after the quake, Weintz said it wouldn't have made sense to comment then because the science was far less clear at the time on what was causing quakes. "We didn't want to be in a situation where the governor was asked to speculate about the cause," Weintz said in a phone interview. But the science was clear enough at the time for other states to go beyond speculation and act. In July 2011, Arkansas had imposed a moratorium on disposal in a broad swath of the state, ending a swarm of quakes there. A month after the damaging Oklahoma quake, Ohio officials moved to shut down several injection wells around Youngstown because of a series of much smaller earthquakes. Fallin's statement, saying disposal is a "likely contributing factor," indicates her team still is less certain about the cause than scientists at the Oklahoma Geological Survey (OGS). The survey issued a statement in April saying it is "very likely" most of the state's recent quakes were triggered by deep injection of wastewater from oil and gas production. Weintz said the statement was not intended to cast doubt on the findings of OGS. OGS had lagged behind the U.S. Geological Survey and other outside seismologists, who had publicly linked the rising earthquake rate in the state to wastewater injection two years earlier. During that time, the number of earthquakes grew sharply. In 2012, quakes happened more frequently than usual. Now, quakes shake some part of the state about every day. Oklahoma had 585 earthquakes magnitude 3 or greater last year -- three times more than California -- and this year it's on track for more than 800. Still, Fallin hasn't been pushed into much of a debate about what to do about the shaking, despite hundreds of earthquakes in the past few years. No bills were debated -- or even introduced -- during the state legislative session that ended in late May. Fallin did sign a bill in late May protecting oil and gas companies from local government ordinances. Days later, she signed a state budget that cuts funding to most state departments, including the one in charge of dealing with drilling activities and earthquakes. Before that, she'd created a "Coordinating Council on Seismic Activity" that meets in private and steered $50,000 to earthquake research. In Texas, which has had much smaller bouts of seismicity, Gov. Greg Abbott (R) last month approved $4.5 million to pay for a comprehensive study of the state's earthquakes. Fallin publicly denied a link between quakes and oil and gas activity until at least February. In April, she reversed, in conjunction with the OGS announcement. She acknowledged the link and set up a state earthquake website (EnergyWire, April 22). Fallin's critics say she should have moved much sooner to address the man-made quakes. "She bought into the industry line for longer than a public official should have," said state Rep. Cory Williams, a Democrat from Stillwater, which is regularly shaken by quakes. "They lost 18 months while they were saying 'The science isn't in.'" Williams says Fallin has gotten more responsive on the quake issue this year, but he says the Legislature and governor should have increased the flow of money to the regulators and researchers dealing with quakes, instead of cutting their budgets. "We're choking off the resources to the people who are taking on the problem," he said. Republican state Rep. Jason Murphey, whose Guthrie district is one of the most shaken spots in the state, expresses similar feelings in friendlier terms. He wishes Fallin had moved faster, but he thinks she has put the state on a better track for dealing with the shaking by acknowledging the link between disposal and shaking and creating a state earthquake website. That gave oil and gas regulators the "political cover" to take steps that might rub the oil and gas industry the wrong way, he said. "She fulfilled her role," Murphey said. "It wasn't soon enough. It wasn't, by then, an act of political courage. But it fulfilled her role." Before April, Murphey said Fallin's aides and advisers were privately candid about the problem even as Fallin publicly avoided the issue and denied a link. He said her team was hemmed in by the state's oil-friendly politics. "They admitted the problem behind closed doors," Murphey said. "She's had to walk a fine line. The politics, the economy and the funding of the state budget is biased toward the energy sector." Some of her constituents say Fallin's handling of the issue is still sorely lacking. Angela Spotts, a drilling critic from Stillwater and co-founder of Stop Fracking Payne County, said Fallin has been unwilling to meet with her about the shaking in her part of the state. A.J. Ledwig, whose house in Medford has been damaged by repeated quakes, said the lack of resources dedicated to quakes shows Fallin still doesn't get it. "I really don't think the governor recognizes the seriousness of what's happening with the earthquakes," said Ledwig, a retired educator. But Joe Reneau, whose house was all but destroyed by the 2011 quake and then rebuilt with insurance proceeds, said he realizes Fallin and other politicians are under a lot of pressure from the oil and gas industry. "In the end, she comes around to trying to seek out the truth," Reneau said. "Politicians are politicians. I don't criticize them." In 2011, Fallin's approach to earthquakes might have been summed up by the words of her blunt-spoken chief of staff, Denise Northrup -- "make this go away." Northrup was annoyed by a Democratic state lawmaker who'd called for earthquake safety training after the November 2011 quake. She sent an email directing the Department of Emergency Management's deputy director, Michelann Ooten, to respond. "Alex, I assume Michelann can comment to the fact that we just do 'disaster' planning not specific to any one type of disaster," she wrote to Weintz, "and make this go away." A month later in Ohio, when state officials got disposal wells in Youngstown shut down, the Ohio governor's director of natural resources said, "While our research doesn't point to a clear and direct correlation to drilling at this site and seismic activity, we will never gamble when safety is a factor" (Greenwire, Jan 5, 2012). When the questions about links between oil drilling and earthquakes didn't go away, Fallin's staff asked for help -- from an oil company. Three days after the quake, a Fallin aide contacted Derek Albro, a lobbyist for Devon Energy Corp. He responded by sending talking points "derived from the ones we developed internally." The next day, Northrup ordered that they be sent to Fallin's constituent services director, Keili McEwen. In an email titled "devon TPs on fracking/earthquakes," Northrup wrote: "Can you get those to Keili to use for response to constituents?" Near the top of Devon's document was a key, if self-serving, point -- "There is no current evidence that oil & gas operations had anything to do with the recent large earthquakes in Oklahoma." Three days after the earthquake, there was suspicion of such a link, but no proof. In the three years since, many outside seismologists have concluded that the quake was caused by disposal of wastewater from oil production. Weintz defended the use of the industry talking points. "It is certainly appropriate for the staff to get information from a variety of sources, including from the energy industry, environmentalists, the scientific community, other states that are working on seismic issues and other stakeholders," he said. The November 2011 quake was centered near the small town of Prague (rhymes with "vague"), about 50 miles east of Oklahoma City. Often referred to now as "the Prague quake," it was actually a series of quakes. It began Nov. 5 with a magnitude-4.7 foreshock at about 2 a.m. local time. It was followed late that night by the magnitude-5.7 "mainshock." Aftershocks continued for weeks. The quake sequence was centered near several injection wells outside Prague. Two were owned by Spess Oil, a small operator from Cleveland, Okla. Another belonged to New Dominion LLC, the major oil producer in the area and also a major employer. New Dominion acknowledged earlier this year that the well had been drilled too deep. The shaking buckled the blacktop of U.S. Route 62 and shook a turret off the administration building at St. Gregory's University in Shawnee. At least two people were injured by falling bricks, and 14 homes were destroyed. State officials tallied up damage to nearly 200 homes and businesses. The upheaval cracked walls for miles around, knocked over dressers, bounced plates off shelves and broke open cracks in the flat, red earth. Fallin asked for federal disaster assistance on Nov. 21, 2011. The federal government rejected the request nine days later, prompting Fallin to say she was "disappointed and frustrated" with the Obama administration. Though earthquake rates had begun rising in Oklahoma in 2009, the Prague quake kicked off the debate in Oklahoma about whether the nation's drilling boom might also be related to a boom in earthquakes. Oklahoma's seismic surge has exceeded anything scientists have seen before. Certain production methods used in parts of the state create uniquely large amounts of wastewater. The volume of wastewater getting disposed of in Oklahoma has doubled since 1997. But in some earthquake-prone areas of the state, it has risen tenfold. Scientists have also found that parts of the state are underlain with faults aligned in a way that makes them prone to slip. The water and geology appear to have combined to create a 400-fold increase in earthquakes. Though she is the highest-profile politician in Oklahoma state government, Fallin doesn't actually have much direct authority when it comes to drilling and earthquakes. Oil and gas is regulated by the Oklahoma Corporation Commission, an agency with sprawling jurisdiction headed by three commissioners elected statewide. The Oklahoma Geological Survey, which researches the quakes, is part of the University of Oklahoma and outside of Fallin's direct line of authority. Fallin and corporation commissioners have said they don't have the authority to impose a moratorium in Oklahoma in the manner that Arkansas regulators did in 2011. Fallin and the Legislature have made no move to increase regulators' authority. Fallin has a secretary of energy and environment, Michael Teague, but he doesn't run any state departments. Instead, he serves as something of a liaison to several agencies, including OGS and the Corporation Commission. But Fallin has influence. For example, when one of the three corporation commissioners resigned in 2011 to work for Continental Resources, Fallin appointed Edmond Mayor Patrice Douglas to replace him. And the governor sets the tone for state government. As governor, people listen to what Fallin has to say. But records show she has shied away from using that "bully pulpit" on earthquake issues. For example, in September 2013, she traveled to Colorado to speak at a forum of the National Governors Association on shale drilling. Drafts of the speech include a line addressing the earthquake risk. "Concerns have emerged around underground injection wells used for disposal of hydraulic fracturing wastewater," the draft states. "Science shows that this risk can be mitigated by placing the underground injection wells away from large active fault lines. As such, I am engaging our state geological service to improve this type of mapping to prevent any risky well placement." Documents indicate it was deleted from the final draft, in favor of a nod to "caution when it comes to the environment and safety." The earthquake issue did come up in Fallin's 2014 re-election campaign. At one debate, Democrat Joe Dorman called for stronger action. Fallin remained noncommittal on whether the quakes were linked to oil and gas. In November, Fallin won handily in the solidly red state. During the campaign, she created the Coordinating Council on Seismic Activity. The council, which is neither a rulemaking nor fact-finding panel, meets in private and has no requirement to report to the public. Among industries, oil and gas was the biggest contributor to her campaign. According to Followthemoney.org, she received $808,896 from oil and gas, topping health professionals, who gave $740,597. But the industry affiliation of many donors was unspecified. Data at Opensecrets.org shows that oil and gas was also her top financial supporter during her two terms in Congress. Oil and gas also enjoys significant political support as a major employer in the state. By one count, one in five jobs in Oklahoma is tied to oil and gas. Fallin and her staff have monitored the earthquake issue closely. In January 2012, Fallin's then-secretary of energy, Michael Ming, told OGS officials that a representative of the governor's office wanted to join their meeting on "earthquake issues" because "this is an issue they are keenly aware of." According to Fallin's calendar, she met on June 6, 2013, with Stanford geophysicist Mark Zoback, an expert on "induced seismicity," as man-made earthquakes are called. He'd already authored an authoritative piece in Science magazine on how to prevent disposal from causing earthquakes. A Zoback study released last month added to the consensus that disposal was causing quakes and said companies needed to stop injecting so much fluid in earthquake-prone areas if the shaking is to be stopped (EnergyWire, June 19). Fallin's aides and their homes aren't immune from the shaking. One staffer, at least, kept a sense of humor about it. Andrew Silvestri, Fallin's then-deputy policy director, emailed then-Energy Secretary Ming the morning after a night of shaking in April 2013. "All your hydraulic fracturing woke me up last night! I want a full investigation!" he wrote, tacking on a smiley face emoticon. He then added an "Editors note" saying, "In case there's ever a fracking open records request -- this was a joke!"